The purpose of this document is to provide information about the technical merits and challenges associated with undergrounding high voltage electricity lines, compared with installing overhead lines. Overall, there are a number of issues that make the undergrounding option more technically challenging and expensive. However, despite the costs and technical challenges, there are circumstances in which underground cables are a more preferable option than overhead cables. This document explains the cost and potential impact on the environment of cable installations. It explains the cable types available and the various installation methods, as well as the separate components that make up an underground installation. Conductors that transmit electricity need to be electrically insulated. One major difference between overhead lines and underground cables is the way they are insulated. Overhead lines are insulated by air, while underground cable conductors are wrapped in layers of insulating material. Air is the simplest and cheapest insulation and the heat produced by the electricity owing through the bare overhead conductors is removed by the ow of air over the conductors. When conductors are buried underground, robust insulation is needed to withstand the very high voltage. 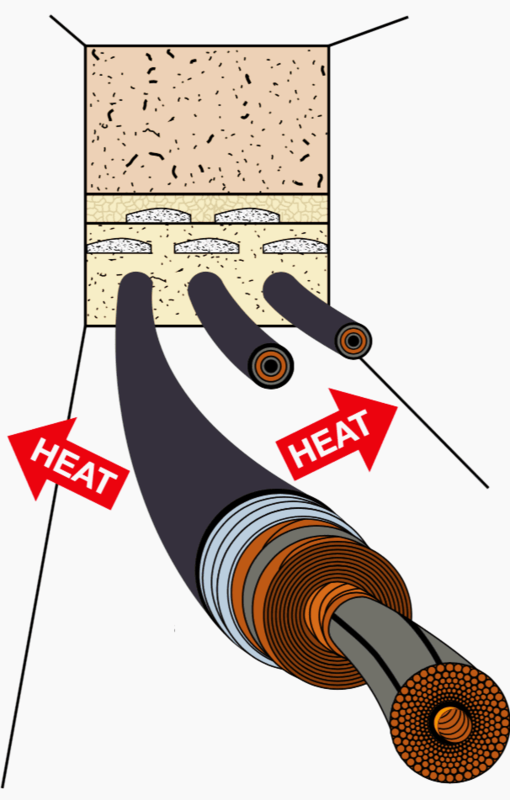 The insulation method depends upon the type of cable used (see section on ‘Underground cable technologies’). Underground cables, because of the insulation and surrounding environment, tend to retain the heat produced in the copper/aluminium conductor. This heat then has to be dissipated to the surrounding environment. 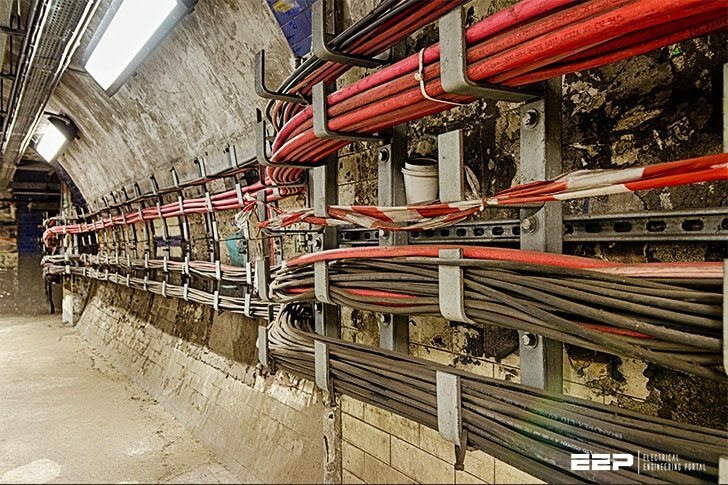 To compensate for this, underground cables are generally bigger to reduce their electrical resistance and heat produced. How the heat produced is dissipated will depend upon the cable installation method. For direct buried cables each cable needs to be well-spaced from others for good heat dissipation. 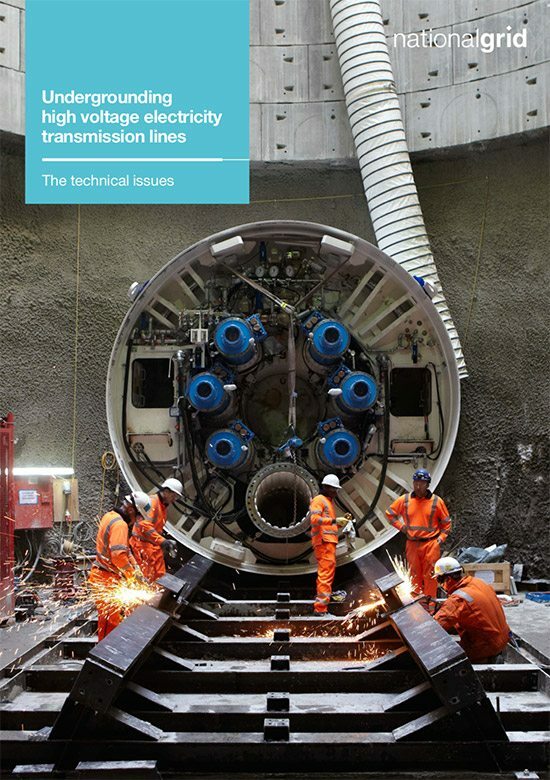 To match overhead line thermal performance for a 400kV double circuit, as many as 12 separate cables in four separate trenches may be needed, resulting in a work area up to 65m wide. In addition, water cooling may be used (see section on ‘Components of underground cable systems’). For cables installed in deep bore tunnels, cable cooling is provided by forced air ventilation or water cooling. When designing a cable system, there are a number of factors to consider relating to the physical environment of the cable, which will help optimise their electrical performance. Adequate heat dissipation to prevent overheating and subsequent reduction in its capacity for carrying current (cable rating). Adequate physical protection to protect the cable from damage and to ensure it is not a potential danger to people while in service. Proper access for maintenance crews to the cable to inspect, repair or replace it.